I had 2 weddings and a honeymoon to plan and work was keeping me pretty occupied too. Anyway, I just wanted to know where do you usually buy your books? As for me, I usually buy them online, as it is way cheaper than getting it at the bookstore...of course it doesn't include those places that has promotions or discounts from time to time like Basement Bookstore in Central Train Station Sydney. Before I hit BUY online, I usually check out Booko.com to compare the books prices. Booko, makes it easy for me to see how much the book costs, shipping charges and delivery time frame. So far, the 2 online sites that I usually use are www.bookdepository.com and www.betterworldbooks.com . I am sure there are plenty of other websites that might be cheaper. But for me to buy books to be shipped to Australia, these would be my 2 recommended ones. Though, Amazon's prices are cheaper if you live in the UK or US, I would say Amazon would be better. Previously, when Amazon.co.uk used to have this promotion - free shipping to Australia, by spending more than £25, I used to buy my books from them, but I found that my books often arrives a lil' damaged. Anyway, check Booko out, it definitely saves you time from checking various sites to compare prices if you're buying online. Did you also know that Bookdepository is having a 50 books, 50 offers, 25 hours promotion now!? *This is my own opinion, and I am not paid to do this. I just thought, this would come in handy for you online book shoppers! Oh oh...on another note, I made my hubby a Nutella Cake for his birthday, similar recipe to this here, but I made some changes. Thanks of these post. 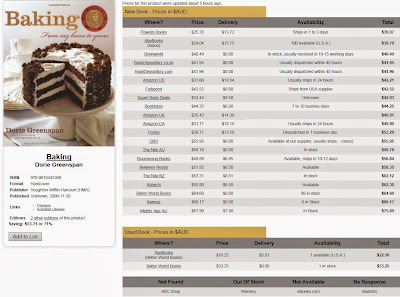 it is extremely great facility for buy cake online or order cake online. Let's do the Egg Jiggle Dance.